Not all the recipients of our Christmas news know about Eric, but it’s probably time for them to find out. (Flat) Eric is nearly 7 now. 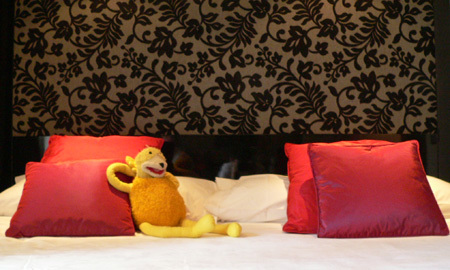 He is yellow, and has a fluffy body with long arms and legs. His chief features are his smile (very wide) and his (rather small) quiff. Eric is related to the Muppets one way or another, but the main reason for mentioning him here is for the times he’s come on holiday with us. 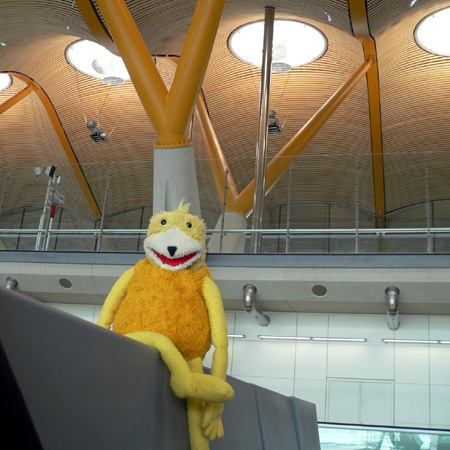 Eric made it to Madrid in May, although it was quite hot out, and he tended to stay put and have longer siestas. The hotel, the Vincci Soho near the Prado, was also rather cool in terms of the interior design, which suited him too. Eric’s chief party trick is to play charades. He’s particularly good at helping shy people who don’t really like playing charades. They can just sit there and Eric does all the actions for them. However, he has also been working on miming to songs. In a recent poll of the favourite James Bond title song, we were pleased for Eric that his key piece, Goldfinger (for obvious reasons), was number one favourite. Perhaps it’s best to let Eric speak for himself… Here are some of the photos from his Madrid trip this year. 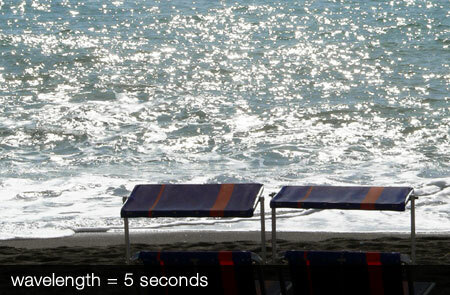 That’s mud to you…Ischia (see post re noise of the surf) is renowned for its hot springs and volcanic mud. As a treat, Dan and I decided to have one of the treatments each, and I went for the mud treatment plus shower (very necessary afterwards). You mostly lie back on the mud, which is spread out on a table with a useful plastic sheet to keep the mud in the right place. Further dollops of mud are added to hands, feet, knees etc. Then they wrap you up, add an extra blanket on top, and leave you to steam for fifteen minutes. I would say it is pretty relaxing – the weight of the mud on your hands means that you have no inclination to move. Although you might worry what would happen if a fire alarm sounded, for example. Clearly, the mud gets everywhere. You get the option to hose yourself down with a hand held shower after, but really you need someone else to help with the shower too, so you’re not left with mud anywhere too embarassing. Another option on the fango option is seeing the fumaroles elsewhere on the island, where steam comes up through mud. It sounds like something you create on a synthesiser, but this was actually the sea around the island of Ischia, in the bay of Naples, where we started our main holiday of the year in October. As the water is less affected by tides than it is around the UK coast, the swell was pretty constant all day, and the sound too. There was a particular low growl to the sound, and even though the waves did come up the beach by varying amounts, the sound remained the same. I tried timing it, and the pattern was just under five seconds almost every time. Not so different from the midge bites on a west coast of Scotland holiday, then. But certainly warmer – even in mid October, temperatures were in the mid 20s centigrade, and even came close to 30 one day. I had previously been unsure about a hot beach holiday – when you’ve grown up with Scottish beach holidays, rain is an expected occurrence at least at some point (and is indeed welcomed to keep the midges off). But after three days, I started to get the hang of sun loungers, particularly with a very useful adjustable part for shading my eyes. A pool that was the temperature of a warm bath was also a good incentive! Our one word of caution: if you want to try Ischia, which we really enjoyed, it seems advisable to speak either Italian or German. Most of the other hotel guests were German speaking, and the hotel staff switched between greeting you in Italian and taking your order for dinner in German…Further practice for me, but it left Dan out a bit. Having seen Bill on TV in Black Books and some comedy panel shows, it was quite a buzz to see his show live. It included him bringing out an Alphorn (which folded out from something the size of a hat box to a musical instrument several feet long), and exiting the stage hugging a large pot plant. I'm a copywriter based in Edinburgh, Scotland. I love writing about food, books, travel and things that make me smile. Frydmania © 2019. All Rights Reserved.